In case you're wondering, I'm doing everything I can so I don't go back to the Crooked Kingdom. :DAgain, I didn't know this is a book. I've seen both animated movies and I liked them. This is a slightly different story, but it's beautiful nonetheless.We have a very nice grandpa telling his two nephews the story of the city of Chewandswallow, a city where people don't buy food at the store. The food just comes down from the sky instead of rain or snow. While Cloudy with a Chance of Meatballs is a fun romp, both the narrative and the illustrations show rather vividly how food can become a rather massive problem when it is uncontrollable or uncontrolled. The story actually seems to combine two European folklore traditions, the legend of the Land of Cockaigne, the so-called Schlaraffenland, a utopian land of milk and honey, where residents do not have to work and where food is not only readily available, but where fish, already cooked, swim in the rivers, and the houses are made of gingerbread and candies, and the many fairy stories featuring uncontrollable cooking and food (magic pots that continue cooking porridge until the entire house is engulfed). There is a strong attitude present that free and magical food (and the fact that one does not have to do much in order to receive or eat it) is not only often too good to be true, but that it can easily have adverse effects if one is unable or in some cases, unwilling to control and master it. I have always enjoyed stories about food getting out of control, and the idea of an El Dorado like food utopia ending up as a dystopia really resonates with me, both tickling my funny bone and also making me think a bit. I wonder though if I would have seen the presented dystopic elements all that clearly in Cloudy with a Chance of Meatballs if I had read this story as a child (probably not). However, even as a child I loved stories like The Land of Cockaigne, where, as mentioned above, food grew on trees, the walls of the houses were made of gingerbread and the rivers flowed with wine and ready-to-eat seafood. And I remember actually trying to take a bite out of my bedroom wall (I was about five at the time) because I thought it might just be made of gingerbread (funny now, but I was rather disappointed when the bedroom walls did not turn into gingerbread for me, and also wondered how I would explain the presence of teeth marks in the wallpaper to my mother). OK, this was really my favorite book for most of my childhood. I would pretend to read it before I could actually read (I had simply memorized it from hearing it so many times) and I remember feeling sooo guilty about all the praise I got for being such a good reader at such an early age. Man alive! Really, I think my love for this book stemmed from the fact that I was a deprived child. Well, I suppose I was never deprived of health food like oatmeal and tofu, but I only got white bread with sweet (or sugary rather) peanut butter @ friends houses. I'm pretty certain I was only friends with some kids for the access to junk food that visits to the their homes allowed me. That being the case, you can imagine what the prospect of a world where such delights fell from the sky and were all mine for the taking would do to me. My plan was to catch extra portions of the foods I liked and hide them under my bed so that I could have whatever food I wanted whenever I wanted it, and nobody could stop me. Yes, while some kids were dreaming of being astronauts and ballerinas I was dreaming of stockpiling junk food under my bed. Sounds about right. Oh, I just loved this book. The irony. I think this book hadn’t appealed to me that much because of the meatballs. Even though I like premises that are silly. First, I assumed the story would be all about meatballs but it was actually about all sorts of foods, and the main story is also actually a story within a story, and that worked really well. Also, in the back author bio section, the illustrator’s blurb in my edition says: “Mr. Barrett says his drawing of meatballs in no way endorses their consumption. He’s a vegetarian.” This book was published in 1978, and I became a vegetarian (most of the time-it took me a while to make the transition fully) in early 1977.The story is funny and creative and entertaining.The illustrations are wonderful! I love how each picture, the black & white and the color ones, seem to be created using tiny lines. I just love the effect; I don’t know what the style is called though, but I know I appreciate it. This is a book about which I’ve always been curious so I’m really grateful it’s one of the June selections for the Picture Books group at the Children's Books group. The month’s theme is culinary. So far, this picture books group’s themes and books have all been wonderful!Now, I’m eager to read the sequel: Pickles To Pittsburgh: A Sequel To Cloudy with a Chance of Meatballs.The story is fun and the illustrations are special. To sum it up: incredibly creative, imaginative, funny, really great illustrations, and the illustrator is even a vegetarian. So, it was my kind of book after all.So many good illustrations but the ones that most tickled my funny bone were Floyd's birthday party scene, a day when the weather provided only brussel spouts and peanut butter with mayonnaise, and the tomato tornado scene. I know I read this as a kid but for some reason it didn't leave me with a big "lasting impression" or any sort of feeling I could really latch onto when I thought about the book as an adult. So, I came to it fresh, in a way. And I was MAJOR impressed! The story is so much fun, so imaginative and hilarious (and a tad scary at times!) and it's the best sort of tall-tale, causing our minds to boggle even as we realize maybe some of it could have shadows of truth in the real world. It might even cause us to ponder the role food plays in our lives. I wasn't sure that I'd enjoy the illustrations at first--the kids and mom at the breakfast table looked a tad odd to me--but I ended up falling in love with them! They were SO detailed and fascinating! And they added so much to the story! I loved the quirky little touches, like the movie theater playing "Breakfast and Tiffany's" and the like. So cute! As one of my favorite books when I was a little girl~ I revisit this book every few years to see if it still holds up to what I remembered & loved. And It is still in my top 5 Favorite books of all time! The story is cute & endearing while being silly & playfully semi-serious at the same time. Plus the illustrations are just flat out amazing. Even after all these years of art enhancements & the digital art age~I still think this extremely detail-oriented cross hatch style of illustration is gorgeous and not seen much of anymore in art, much less in children's books. There are so many hidden gems drawn within each of the panels & the I still adore the subdued color pallet on some pages in contrast to the straight black & white illustrations. I also think it teaches the subtle lesson of "too much of a good thing"
Mother nature cooks up a storm, literally, in this madcap story with plenty of silliness to go around.Ages 4-10The town of Chewandswallow has some wild weather, bringing meals like burgers, spaghetti, mashed potatoes, and of course meatballs three times a day. Then, things start to go crazy and odd things start happening, like an entire day of just gargonzola cheese and eventually a "tomato tornado" and the poor sanitation department could no longer keep up. This book uses such fun language to describe weather effects, like drizzle, clearings, and downpour. The language is delightful and the illustrations, while not overly colorful, are still detailed and fun. The absurdity and silliness in this story make it a joy to read and the combining of two familiar concepts, food and weather, into one story are sure to stoke the imagination. Kids of this age group will love the fanciful, over the top, giant ideas presented in this book.About This BookHere's another wonderfully written and illustrated story by the Barrett team. Receiving a place on the prestigious New York Times Best Illustrated Children's Books of the Year list, this book skillfully and subtly blends funny storytelling and full-color illustrations with a very real twist about how weather can affect people's environments.Life in the wonderful town of ChewandSwallow is great: Some of its citizens even say it's downright delicious! Instead of snow, wind, or rain, they get a different kind of weather that falls from the sky three times a day: breakfast, lunch, and dinner. The only bad part about living in ChewandSwallow is that the people don't get their choice of what they'd like to fall from the sky: it may snow mashed potatoes, or rain juice or soup, or there might even be a storm of hamburgers that takes them by surprise. But no one is too worried about the weather, until it takes a turn for the worse — the portions of food get larger and larger and fall faster and faster, until everyone in the town fears for their lives. They all need to think of a plan, and they need one fast! With teamwork, smarts, and some extra-large bagels, Chewandswallow residents are able to save themselves from the torrential weather. A cheerful approach to gearing up for a science lesson or just for reading aloud, this book makes food and weather fun.A good review and I agree that it is a good starting point for a weather discussion, especially because of the great terms used in the story. My daughter came home all excited about reading this book in school today. My son then chimed in and I soon had two children dancing around my kitchen telling me all about this book and laughing hysterically. I supposed I should read it myself before I recommend it, but my children definately gave it "two thumbs up"! I loved this book. The artwork is wonderful and the way the text is so dry and matter-of-fact is so funny. I can't wait to see the film. We read to our children often when they were little, 20 some years ago. We picked this one up by chance, and I have to say, from the moment we first opened the pages it has stuck with not just me, but them as well. What a fabulously creative book, one that opened little imaginations wide. Wonderful prose, and illustrations that took that imagination for a ride. We later watched the movie together as this was *the* favorite book in our house. It was fairly disappointing. Do yourself and your children a favor and read this original book, rather than the movie book, it does not compare. This is my favorite picture book. Even as a teenager, I'd hunt his book up from time to time to make sure I'd memorized all the lines correctly.This story reads exactly like all stories told by your grandfather are supposed to. The ones where, as a kid, you keep saying 'really! ', then try to verify everything via grandma, who then yells at grandpa for filling your head with nonsense. Very cute story with a different story inside. I can see why the kids like it. It is yummy! You know you're in a wealthy society when kids read about the sky raining food. Aside from this obnoxious premise, a highly creative, surprising story. Kudos to Barrett for including composting. I read "Cloudy With a Chance of Meatballs" by Judi Barrett. The story is narrated by grandpa to his grandkids. He tells of a far off land called Chewandswallow. There all the weather is food. It snows mashed potatoes, rains soup, and accounts for the townspeople's three meals of the day. Life in Chewandswallow is good until the weather takes a turn for the worst. The portions are getting bigger and so is the food. It finally gets so bad the the townspeople have to make boats out of stale bread and leave the island for good. No one knows what became of Chewandswallow, but nobody dares to go back!Grandpa is the main character. throughout the book he tells his grandkids stories and makes them pancakes. He is kind, gentle, and a very good storyteller.The story takes place in the town of Chewandswallow. It is a town on a small island. There is no direct time period, but it seems relative to current time.Overall I would give "Cloudy With a Chance of Meatballs" five out of five stars. I would recommend it to any reader because it has a good message, is a quick read, and has a simple vocabulary. The incorporation of pictures also really helps bring the story to life. Back in January I wrote a review of the film version of Cloud with a Chance of Meatballs and I promised a longer review of the book by Judi Barrett. I apologize for the delay. I really don't know where the time as gone!The book has a framing story that begins with a mishap during breakfast. The grandfather is inspired and tells the children about a place called Chewandswallow where the weather brings food three times a day. Except near the end of the town's existence, the food gets too big and starts to be a threat to the well-being of the townspeople.As the story is presented as a tall tale, there's no need to explain the mechanics behind the food weather or the sudden increase in the foods' size. Without that framing story I would have found the book annoying.Although the illustration style of the book is very clearly a product of the late 1970s, the film manages to recreate many of the iconic scenes (though with different circumstances behind them). I liked seeing that connection between book and film even though they are otherwise so very different. A great story - tells not only a fascinating tall tale about the town of Chewandswallow, but also talks about the closeness of extended family. Who doesn't love a story about Grandpa's tall tales? Our oldest loves this tale and we've read it a couple of times. This story was selected as one of the books for the June 2010 - Culinary Delights reads at the Picture-Book Club in the Children's Books Group here at Goodreads. My son (10 years old) was so excited when I brought this book home from the library to read and discuss with an online group. "That's the best picture book ever!" he exclaimed. "But it's nothing like the movie." And even though he's proud to be a tween and considers himself practically grown up, he grabbed the book out of my hands to read it again.It is an excellent story, very imaginative. I loved the setting - a grandfather telling his grandchildren a tall tale that kept their imaginations going the next day. It brought back pleasant memories of stories that my own grandfather told me. Imagine if you lived in a town that only rained food and never rained rain! This story takes weather to a whole new level as readers giggle their way through the climate of one particular town. All is dandy until the townspeople starts to notice weird arrangements of foods storming in. Brussels sprouts with peanut butter? Loads and loads of broccoli? Really? The best part of the book, in my opinion, is looking at the imaginative illustrations. Not only to they make me laugh out loud, but they get me thinking about what this would really look and feel like to live in such a strange town. I highly recommend this book to anyone of any age. A very imaginative story! If I wanted food to fall from the sky, what would it be? That would be a nice exercise for kids who read the book. The sequel, Pickles to Pittsburgh, wasn't nearly as good. This one, though, is a winner. This book always made me a bit queasy. This story begins with a family preparing for breakfast, a grandpa is making pancakes for his grandchildren and have a fun time making everything. Later on in that day the grandpa decided to tell his grandchildren a bedtime story about a place that was called Chewandswallow and how it was different from any other town ever. The difference about this town was its weather as it was no typical rain and snow, but the weather would be food. It came around every time when it was time to eat. There was no need for a supermarket as everyone in town had eaten whatever the weather had served. It would serve breakfast in the morning such as orange juice, bacon and eggs and later on would serve something different. The town even had a system of what to do with the leftover food that was not eaten and everything seemed very organized. Eventually the food coming from the sky became bigger and bigger eventually being too dangerous to go outside. The food had been destroying buildings and the towns causing for everyone to leave before it gets to dangerous. From then on they had used some of the food to make boats, sail away from the town and found a town which was just as average as any other town. They had to adjust their lifestyle to getting food in the supermarket. The story then goes back to the grandpa and his grandchildren and how amazed the story was. The next day it had snowed and the children felt as though they can see and smell food. In my opinion I think that this is a great story especially for children because of the imagination in this book. I remember reading this book when I was younger and how much I really wished it could rain food. This story itself is very unique and brings its own originality especially in its illustration. I think that due to the movie as well it is the reason why this book is so well known to children. I find it kind of silly at the end when the people from that town had to live like everyone else because to me it seems so average. I do not think that there is not one child who does not like this book because it brings so much creativity to the table. 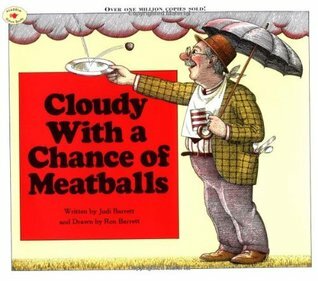 "Cloudy with a Chance of Meatballs" by Judi Barrett was a good children's story with an original idea. I wasn't that in love with the illustrations in this book, but I believe that this was an interesting story for children because of its creativity. My actual rating is 2.5/5 stars. I mean, it's a cute book, but it's so silly. I guess that would be what makes kids like it so much? But for me, it was boring. We never find out why the weather went haywire. A delightful and imaginative book telling the story of a town where the weather systems are made of food, and what happens when the weather goes awry. Three stars for the story, the fourth for the illustrations, which were wonderful. We are now longing for a giant pancake to land on our school! Judi Barrett Ron Barrett - Judi Barrett is the author of many well-loved books for children, including Cloudy With a Chance of Meatballs, Pickles to Pittsburgh, Animals Should Definitely Not Wear Clothing, and Things That Are Most in the World. She teaches art to kindergarten students at a school in her Brooklyn, New York, neighborhood. And she usually doesn't mind going to the dentist!